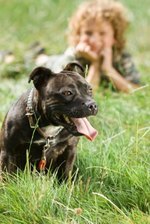 Dog aggression is a common trait in American Pit Bull Terriers (APBT), according to the UKC's official breed description, which states that "most APBTs exhibit some level of dog aggression." Real or imagined, Pitbulls have a notorious reputation for aggression toward humans. But, they are also among the most intelligent and willing participants for dog training and are loyal and eager to please their owners. Be consistent with your rules to command respect. Do not bend the rules even once. For example, do not give into any begging for table food or allow your Pitbull to sleep in your bed. Maintain a commanding voice that is direct and firm without yelling. Treat your dog gently, but at the same time let it know you're in charge. Control everything that goes on in your territory (your home) including regular and controlled feedings and times devoted to its attention. Restrain your affection. For example, do not pet your Pitbull every time it asks for it or place yourself physically lower than it is to pet it such as laying down next to it. Demonstrate your dominance. Examples include eating your meals, going through doorways first, never showing fear toward your Pitbull and winning every game you play with it. Refrain from creating a "rivalry over a resource" situation. For example, whenever you take away its food or toy before it is finished, intrude in its sleeping area or step past it in a narrow hallway, it may consider your actions as being antagonistic.